Poor Dan Harris. I did a search looking for video of him from World News Now – because once upon a time I kept what a friend called vampire hours, and I loved WNN. I had a massive crush on Kevin Newman. I had no idea Dan Harris – and Anderson Cooper! – hosted the show, and I wanted to see. However, what comes up when you look for a video with Dan Harris is pretty much mostly that panic attack that was the impetus for the whole story. I always liked Dan Harris on ABC. He is extremely self-deprecating throughout the book, mocking his own baby face and whatever else he sees as his faults (I giggled when he talked about pacing “like a chihuahua doing dressage”), but I always found him engaging. I never did realize how harsh the tone of his voice could be until I started this book and almost gave up right away – but I adapted pretty quickly, and had no troubles with is reading of his story. We were always an ABC News family – all the major events in my lifetime have been narrated by Peter Jennings and Charlie Gibson and their colleagues. 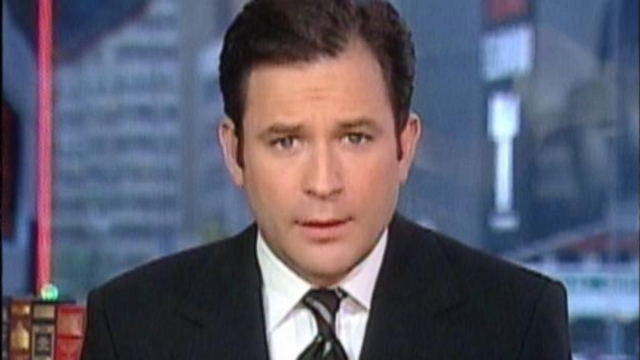 But I missed that morning, the day Dan Harris had the panic attack; it was only when this book came about and he sat down with Diane Sawyer to talk about it that I saw what “deer in the headlights” really looks like. I remember mild shock at his revelations about his drug use, and I remember being impressed at his frankness. And I was also impressed by what he said about his attempts, and success, at rebuilding himself from the inside out. I tried the sample of the book on Audible, and then, sort of glancing over my shoulder to make sure no one saw me buying a book about meditation, swapped a credit for it. 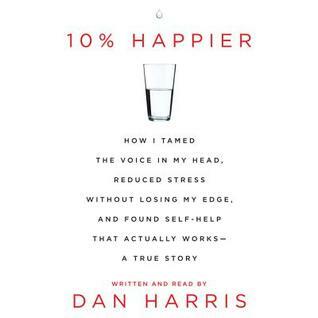 Part of 10% Happier is memoir: how Dan Harris got to where he was when it all started to unravel, and how he figured out how to weave it back together. He’s not an altogether nice guy – he says it himself. He doesn’t really altogether get “nice”. (He is also strongly prejudiced against NPR. This is a man who would apparently rather be unemployed than work for NPR. I tend to wonder if he’s ever actually listened to NPR.) He doesn’t have much patience for weakness, in himself or anyone else – perhaps part of why he dove headfirst into drug use when as a journalist he had access to plenty of first-hand stories of what drugs do to you; he declined to believe that he would be that feeble. He’s also not a man who finds it easy to seek help, so his search for enlightenment had rocky beginnings. There are some wonderful catch phrases all through the book, like “Praise Allah – but tie your camel to a post”, and “I said be simple, not a simpleton” and “Shed light instead of heat”. And I absolutely loved – and identified with – “Your demons may have been ejected from the building, but they’re out in the parking lot doing push-ups”. It goes deeper than that, to a degree that this book can be used as a sort of a gateway into meditation, into Buddhism as advanced common sense. True to his background, Harris developed a sort of “elevator pitch” to encapsulate what he seeks and what he finds in meditation, which boils down to the idea that it has made him ten percent happier. That’s no small accomplishment, when you get down to it. There’s a lot of good stuff in here, lots of hooks on which to hang a better understanding of the whole discipline. Most of all, though, the most encouraging thing about the book is that if indeed meditation works, if it does indeed do what all those slightly alarming whole-grain dreadlocked loosely clothed hippies (Dan Harris’s antitheses) said it does, it is attainable. Because … seriously? If this guy can do it, anyone can. This entry was posted in books, non-fiction and tagged 10% Happier, Buddhism, Dan Harris, meditation, non-fiction. Bookmark the permalink.